Built between 1900 and 1908 the eventually 109 strong Wainwright C Class 0-6-0 tender locomotives were one of the first three new designs introduced after the creation of the South Eastern and Chatham Railway following the legal union of the South Eastern Railway and the London Chatham and Dover Railway. The class was long lived with only two not passing into British Railways ownership. The last members of the class were not withdrawn, mainly as a result of the Kent Coast electrification, until 1962 (although three survived into departmental use as Ashford Works shunters until 1966). 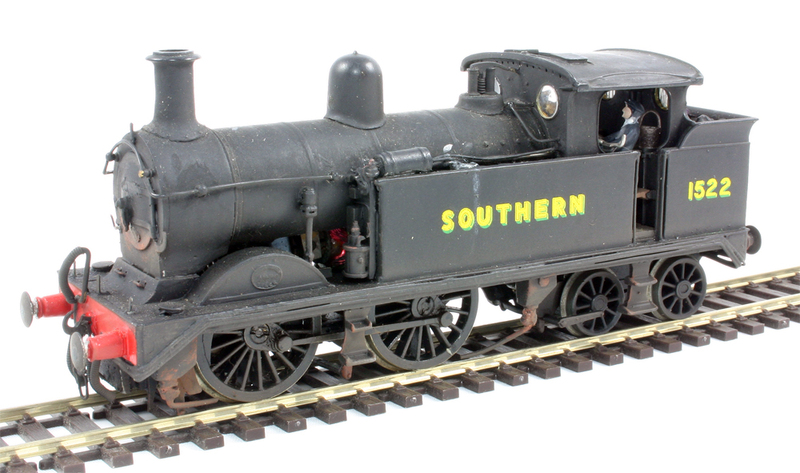 With excellent riding qualities the C Class were often found on passenger and excursion duties as well as their primary role on goods trains throughout originally the SECR and subsequently the Eastern Section of the SR. Number 592 is now preserved on the Bluebell Railway. Bachmann have certainly done an excellent job in capturing the looks of these engines and the initial impression is very positive. 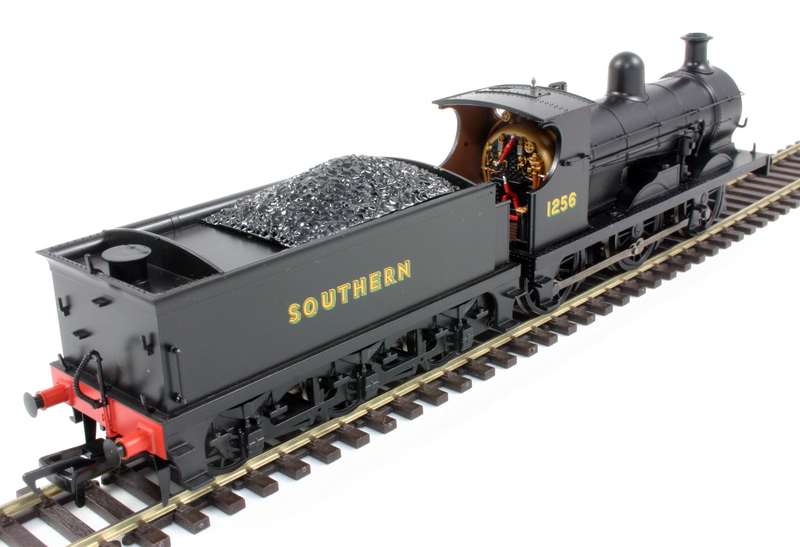 The SECR livery application is extremely fine, pretty much second to none, capturing nearly all the intricate lining and lettering including the tiny SECR lettering on the tender axle boxes. The steam reverser however should also be lined but is in plain green on the model presumably due to limitations in the printing process. The other limitation of the livery application in model form is the finish of the brass dome does not quite match the highly polished original. 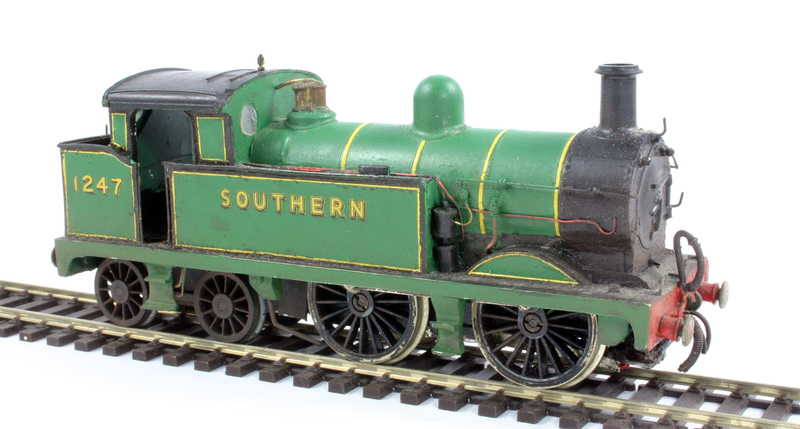 Bachmann have also tooled for the correct taller original pattern chimney on the SECR livery version which is different to the other two releases. I am sure many sales will / have occurred just because it looks so pretty. On the post 1940 Southern black version illustrated here the lettering and numerals, shaded in green, are nicely applied and correct in that the numbers do not have the same inside black line as the lettering on the tender. They certainly look very comparable to my usual preferred use of HMRS decals for most of the SR post 1937 black locos in my fleet. The underframe detail including the brakes, sandpipes and guard irons are all finely moulded including those on the tender. Brake rigging is supplied for the purchaser to fit to the locomotive and tender, although this is quite fiddly especially on the loco needing to take care around the sanding pipes. The loco to tender coupling is a semi permanent fixed bar and is adjustable to shorten the gap between the loco and tender. The DCC plug location is in the tender so the wires between the loco and tender are connected via a small plug, very similar to that used by Hornby for a while now, which will make splitting the tender and loco apart if necessary much easier. It should be noted however that no pick ups are included on the tender itself which is a shame. Bachmann’s usual use of a cast metal coal load helps give some weight to the otherwise quite light tender however if the load is removed it leaves a flat topped tender with a two locating holes rather than any representation of the albeit very small coal space, I assume that this is compromise to leave enough space inside the tender for the fitting of a DCC Sound speaker. 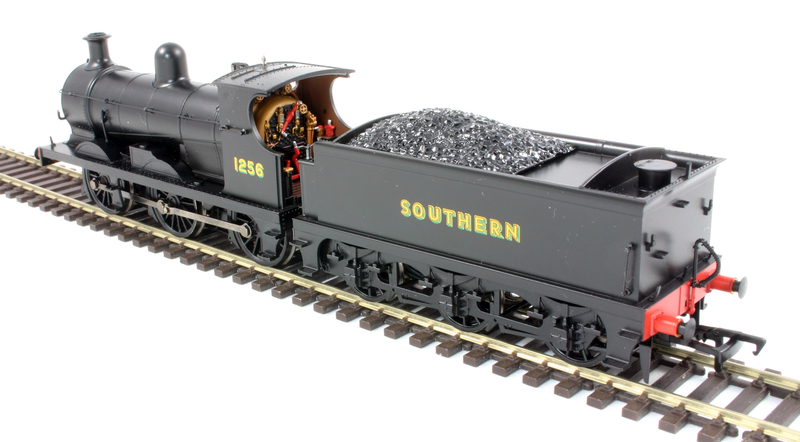 I am not personally convinced by the coal effect this gives and will be adding a layer of real crushed coal once the loco is weathered. On the all over black livery versions the fine details unlike that of the SECR livery are sometimes lost and some light weathering will actually help accentuate this detail. 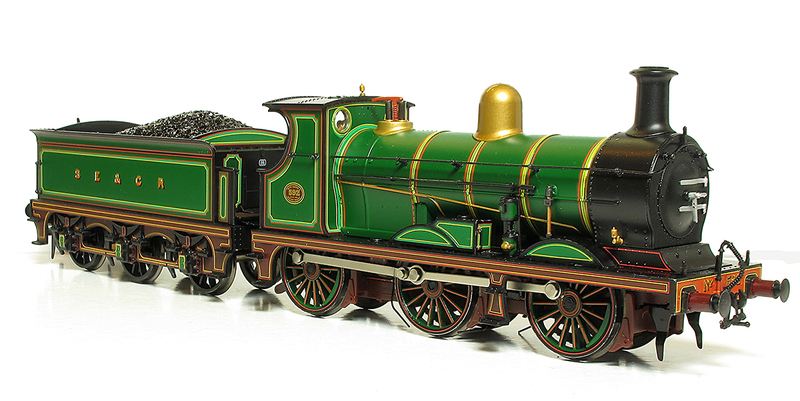 The motor and drive is very well concealed within the firebox and it does protrude slightly forward of the front of the firebox, which is more noticeable on the SECR green version due to the prominence of the end of the polished boiler band but less so on the black versions. This does leave the correct daylight under the boiler but it is a shame that Bachmann have not included, unlike some recent models, any representation of the inside motion between the frames here as just a flat plate is visible. A lovely wealth of detail is present including lubricating and control pipework especially around the steam reverser, hand rails and lamp irons. 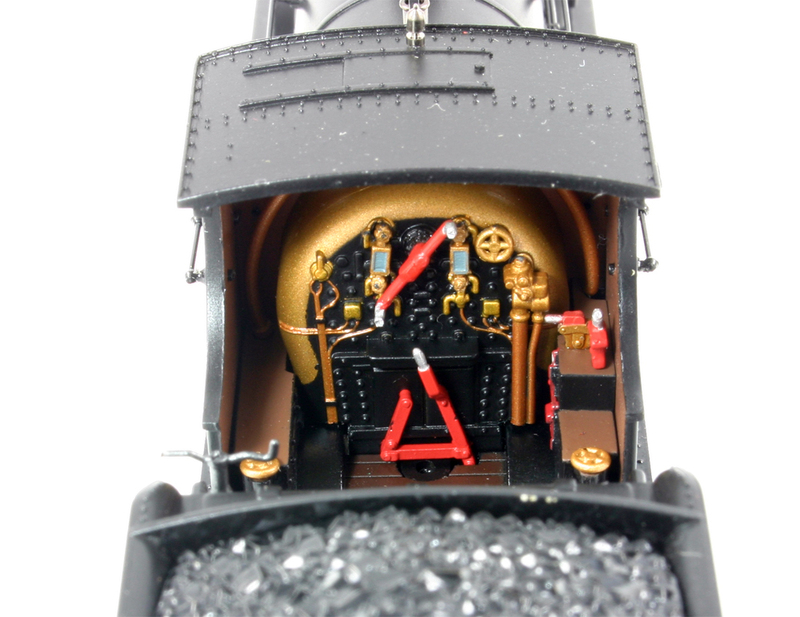 The detail inside the open cab is excellent and Bachmann have recently upped their game with such detail including the painting and printing. Like some recent Hornby models there is even representation of the letting and needles on the pressure gauges. 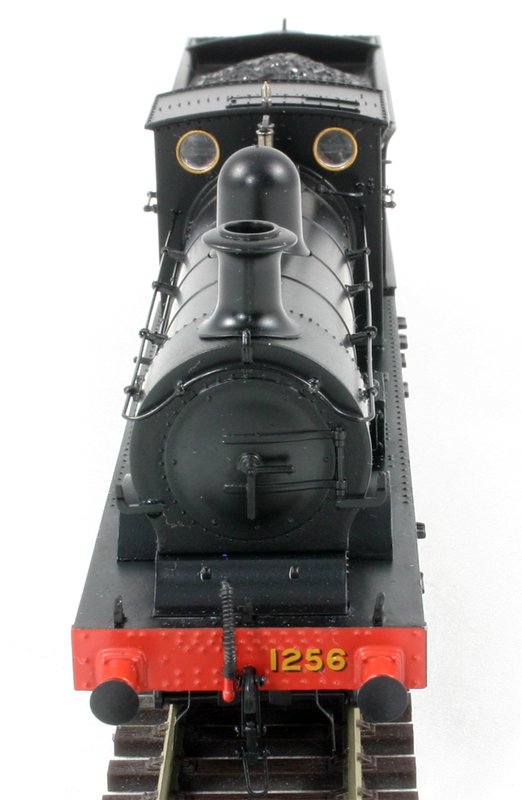 Curiously all versions have the protruding top of the firebox inside the cab painted in brass. Whilst this is likely to be correct for the SECR livery version I am not convinced it would have looked that way in later life as per the other livery variations. As well as the brake rigging already mentioned for the purchaser to fit the model also comes with nicely moulded screw couplings one is factory fitted to the Loco and a spare for the tender if the tension lock coupling is removed; cab doors that will need to be glued in place as there does not appear to be any locating devices for them; and a nice set of fire irons for the tender. The only thing missing these days from the main manufacturer’s products are loco crew, but I assume that these ideally would need to be painted and would therefore increase costs too much. Overall this model of the C Class is a sure fire winner and hopefully it will convince Bachmann to consider other such southern area pre grouping prototypes in the future.